Ralliers started at the ICE office and marched to the Liberty Bell for a Rally Saturday Afternoon. 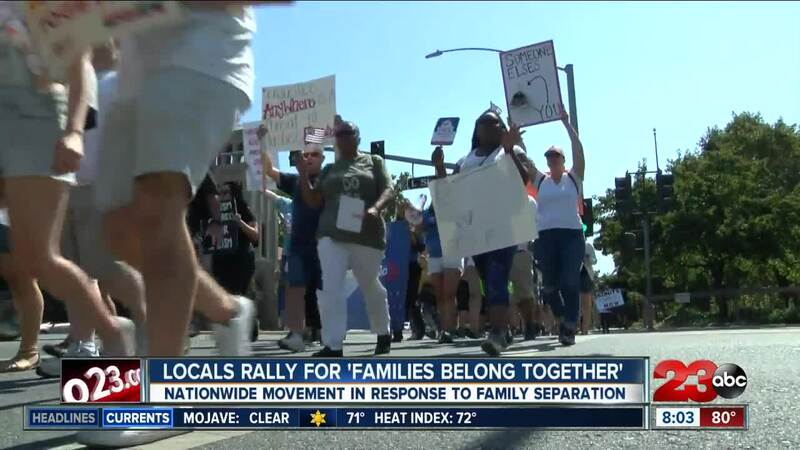 More than one thousand people gathered in downtown Bakersfield to take part in a local“Families Belong Together” march on Saturday. Women’s March Kern County, NextGen California, United Farm Workers Foundation, American Civil Liberties Union of Southern California, Indivisible-Citizens of California’s 23rd Congressional District, Dolores Huerta Foundation, Council of American Islamic Relations-L.A., Kern Welcoming and Extending Solidarity to Immigrants, Farmworker Institute on Education and Leadership Development and the California Nurses Association co-hosted the event that is being in several cities across the country. In response to President Trump’s “zero-tolerance” separation policy, protesters rallied at the Liberty. More than 600 marches were planned throughout the country as those in attendance demanded the Trump administration reunite thousands of families separated at the U.S.-Mexico border. More than 2,300 have been separated from their families in recent weeks under the Trump administration's "zero tolerance" policy in which undocumented immigrants entering the U.S. illegally face being prosecuted. But after public outcry, President Donald Trump ordered that the families crossing into the country illegally no longer be separated. However, more than 2,000 children still remain separated from their parents. Saturday's marches hope to urge the administration to reunify the divided families as quickly as possible.